If you are looking for an active and competitive dinghy fleet in the San Francisco Bay Area, then the Vanguard 15 is your boat! 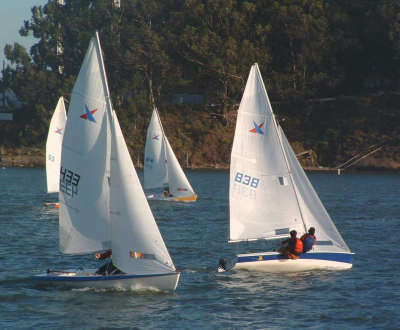 Our fleet began in April 1998 with 8 boats racing on the Alameda Estuary. Today, we are based at Treasure Island Sailing Center (TISC) and have over 30 active boats racing year around, including a few of the original boats! Fleet 53 is one of the largest V15 fleets in the country and among the most active one-design fleets in San Francisco Bay. This strict one-design boat is exciting, yet easy for two people to race. We welcome all skill levels, from collegiate All-Americans and Olympic campaigners, to big-boat sailors looking for tighter action, to novices that want to learn the sport of sailboat racing. The fleet hosts weekly fleet and team racing from April through September at TISC in Clipper Cove where good breeze and flat water can be found. There are also weekend regattas held at various West Coast venues that make up the Championship Series. Register for part or all of the series with TISC. Show up at the venue on Thursday in time for a 6:30 first signal. Please contact Thursday Night Chairs Cameron Barclift and Eliza White at v15.thursdays@gmail.com with any questions. The Tuesday Night Series is dedicated to high-level but casual 3-on-3 team racing. Anyone interested should contact Tuesday Night Chairs Kristin ALtreuter and Taylor Burfield for more information. Prior team race experience or other extensive dinghy racing experience is preferred. We welcome sailors who'd like to get involved with our fleet. Join our Mailing List and Facebook group to learn more about our fleet and activities. If you are interested in getting out on the water but do not have a boat, we have a V15 available to Charter for team or fleet racing. If you would like to crew fill out a posting on the new Crew List. If you have a boat and want to be part of the fleet, enter your information on the Roster.